The ﻿Weslo Cadence G 5.9 Treadmill﻿ is one of the best home treadmills for those looking for a motorized, indoor running solution. The easy-to-assemble, foldable qualities make for an asset to any living situation, from an inner-city studio apartment to a suburban home. Choose your ﻿own workout﻿ and track calories burned, distance, speed and time elapsed on the LCD screen. Those needing more inspiration, however, will find help in one of the Weslo G 5.9 six certified personal trainer workouts. These options add variability to limit the potential boredom of running in place. ﻿Treadmills﻿ need to serve one major function - provide an option to run indoors, safe from the elements and in the comfort of one’s own home. The Weslo Treadmill features the luxury of a motor, as opposed to some other motorless treadmills that attempt to mimic the strain of running outdoors. This could be good for those who don’t necessarily enjoy running, as it makes it a bit easier to keep going. Elite runners, such as marathoners and sprinters needing a ﻿winter train﻿ing option﻿, may want to opt for a motorless choice. 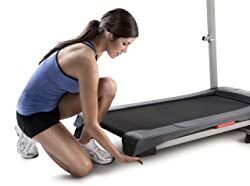 A standard motorized treadmill offers multiple speeds and an incline option, both of which this version includes. Users will also want something easy-to-use, as getting started is often the most common barrier to working out and a machine that won’t break the bank. Unless you’re a gym owner with tons of room to spare, the size and noisiness of your treadmill should be considered. You don’t want to scare the neighbors every time you train, nor should your treadmill take up half of the room. The best feature of this model is likely its collapsible nature. 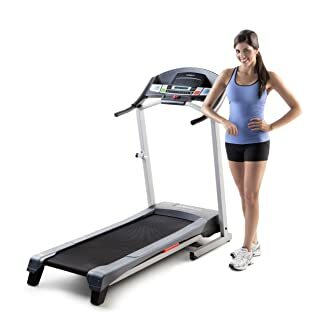 At about five feet long and over two feet wide (64.5"-L X 29"-W X 55.5"-H), the ability to fold this treadmill can add a good chunk of space to any room. At its full extension, this treadmill takes up about the same amount of space as a piece of furniture. Assembly is required, so designate a few hours before jumping on for a workout. Attaching the top half to the belt has given some users a hard time, so you might want to phone a friend for help. It seems to have a standard plastic base, arms and screen that could potentially crack with rough shipping. This treadmills sleek design lets you choose from three weight loss workouts and three intensity workouts alongside an incline. Most importantly, the emergency stop has a clip you can attach to your clothes, in case you trip or pass out from exercising. This stop will immediately slow the belt to keep you safe. 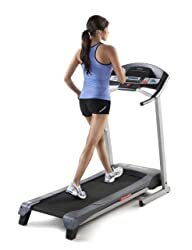 Although the treadmill only features two positions - flat or a small incline made by lowering the rear feet - the ability to slow down for a brief rest adds allure. Runners can press the minus button and the treadmill will drop speed for 60 seconds before returning to the original setting again. If you’re into ﻿interval training﻿, you’ll enjoy being able to slow without the hassle of re-starting to get back to a working speed. And if not, the six personal trainer workouts can stir up some motivation for new exercisers and old pros alike. Current owners appreciate the low hum of the motor - often you won’t even need to turn up the TV to continue your program. This is an affordable, durable choice that’ll give you bang for your buck. 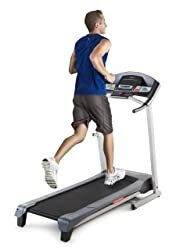 In contrast, athletes looking for an indoor sprinting option will find it difficult, as this Weslo Treadmill only goes up to 10 mph, which is only a fast run. Additionally, anyone training for a hike might look to a treadmill with more incline variability. 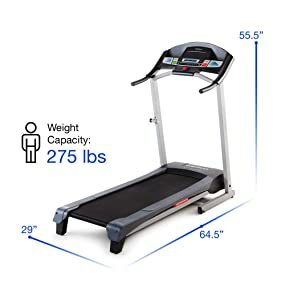 The manual states the maximum weight of 275 lbs as a safety and durability limit, which could be a con for exercisers needing an accessible weight loss option or those that expect heavy use. The added Comfort Cell™ Cushioning, however, does allow for better shock absorption to ease stress on joints. A few users have complained of early wear and tear, but it does come with a 1-year motor warranty and 90 days for parts and labor. In general, the Weslo Cadence G 5.9 treadmill is a great standard use option for indoor walking and jogging. I’d recommend it for the average exerciser, especially those who just need a little extra motivation to get off the couch. The affordability, ease of assembly plus variety of settings make for an asset to any in-home workout.